Texas A&M International University (TAMIU) students will have a chance to tour the mobile studios of the Cable-Satellite Public Affairs Network (C-SPAN) during their upcoming visit to Laredo. 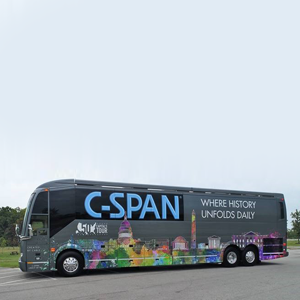 The C-SPAN Bus will be in front of the TAMIU Student Center on Tuesday, Feb. 12 from noon to 2 p.m. Various student groups are planning to tour the bus to view interactive kiosks and enjoy demonstrations. Through the tour, students will learn more about the in-depth coverage offered via C-SPAN, including its extensive video library. Approximately 250,000 hours of searchable content is accessible for research and educational purposes. The multimedia, mobile classroom travels across the United States and has made stops at major colleges and universities, including two previous stops at the University. Take a look inside the C-SPAN Bus at https://www.youtube.com/watch?v=7XBHMhHQv1k&feature=youtu.be. Keep up with all the latest stops made by the C-SPAN Bus through social media at https://www.instagram.com/cspanbusor https://twitter.com/cspanbus. Launched in 1979 by the cable television industry as a public service, C-SPAN aims to provide public access to the political process. C-SPAN regularly televises proceedings of the United States federal government, as well as public affairs programming. For more information on the C-SPAN Bus visit to TAMIU, contact Dr. Alfonso Vergaray, TAMIU director of International Leadership at 326.2604 or alfonso.vergaray@tamiu.edu.